There are fundamental and technological limits of conventional microfabrication and microelectronics. Scaling down conventional devices and attempts to develop novel topologies and architectures will soon be ineffective or unachievable at the device and system levels to ensure desired performance. Forward-looking experts continue to search for new paradigms to carry the field beyond the age of microelectronics, and molecular electronics is one of the most promising candidates. The Nano and Molecular Electronics Handbook surveys the current state of this exciting, emerging field and looks toward future developments and opportunities. Explore the fundamentals of device physics, synthesis, and design of molecular processing platforms and molecular integrated circuits within three-dimensional topologies, organizations, and architectures as well as bottom-up fabrication utilizing quantum effects and unique phenomena. Stay current with the latest results and practical solutions realized for nanoscale and molecular electronics as well as biomolecular electronics and memories. Learn design concepts, device-level modeling, simulation methods, and fabrication technologies used for today's applications and beyond. Expert innovators discuss the results of cutting-edge research and provide informed and insightful commentary on where this new paradigm will lead. 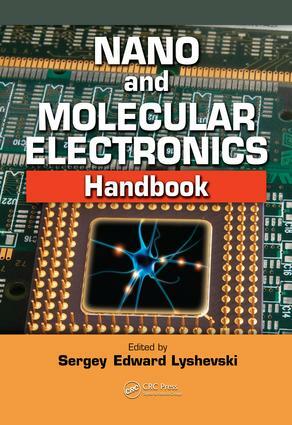 The Nano and Molecular Electronics Handbook ranks among the most complete and authoritative guides to the past, present, and future of this revolutionary area of theory and technology.